Relief From Itchy Eczema May Come In The Form Of A Shot : Shots - Health News About 35 million people have eczema, a skin disease that includes itchy patches of inflamed dry skin. About 10 percent of cases are moderate to severe and may be helped with a new treatment. 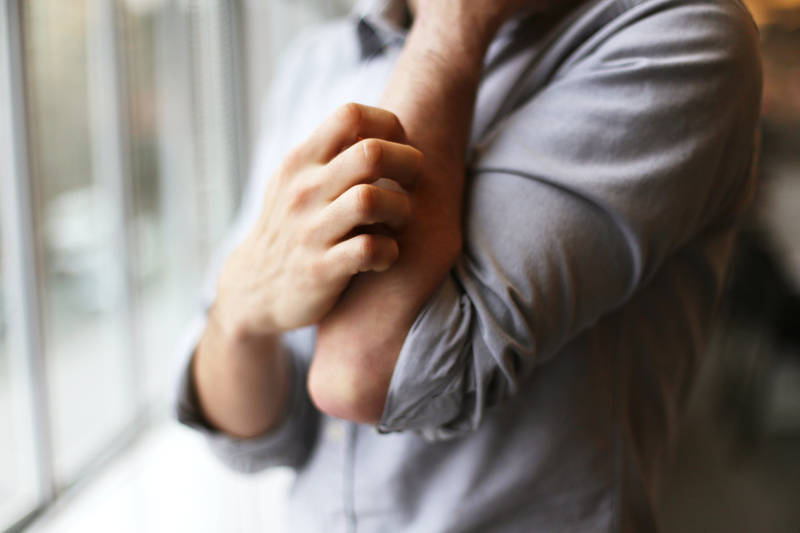 A new treatment may help reduce the itch of atopic dermatitis, which will reduce flare-ups. People with moderate to severe eczema may benefit from new treatments that significantly reduce the intense itching that comes with the scaly skin disease. A study published Wednesday finds that the antibody nemolizumab, given as a monthly injection, not only reduces itching significantly but also clears up many of the patches of dry, inflamed skin that are part of the disease. It appears in the New England Journal of Medicine. "At 12 weeks there was very significant improvement," says dermatologist Jon Hanifin of the Oregon Health and Science University. "Not 100 percent, but patients were delighted not to have the itching that was keeping them up at night." The study was done in 216 patients with moderate-to-severe eczema to determine the best dose of nemolizumab. They were randomized to receive either a placebo or a low, moderate or high dose of the drug, injected once a month. Those who got the low dose reported a 44 percent reduction in itching, using a scale of 1 to 10. Patients who received moderate doses reported a 60 percent reduction in itching, while patients getting high doses reported 63 percent less itching. Eczema, also called "atopic dermatitis," is caused by a malfunction in the body's immune system, leading to a loss of the proteins needed to form a protective skin barrier. About 35 million Americans are estimated to have some form of the disease. The majority have mild cases which are usually helped with moisturizers to prevent dry skin and sometimes prescription medications to reduce inflammation. But about 10 percent of patients have moderate to severe eczema which, according to Hanifin, is a "conservative estimate." For these patients, the severe itchiness can make it nearly impossible to sleep and the creams typically used to soften dry skin and relieve itching may not work very well. They often have to take time off work and see several doctors before finding one that can help treat the chronic disease. In an editorial accompanying the study, pediatrician Lynda Schneider, who directs the Allergy Program at Boston Children's Hospital, says the new medication is uniquely promising because it targets the need to scratch. "If you can target the itching, this makes a big difference." "If patients aren't scratching they are not disrupting the skin barrier," she says. When the barrier is broken, bacteria can pass through the skin, exacerbating the scaly rash. Therapies like this one that boost the immune system and help treat moderate to severe eczema are an exciting advance, Schneider says. Nemolizumab is one of several drugs being studied in a new class of medications for eczema that act on the immune system. Researchers have focused in particular on the role of cytokines — chemicals that are released when the immune system kicks into gear in response to a bacterial or viral invader. In eczema and other autoimmune diseases, the immune system attacks itself. Cytokines called interleukins are released, which block the production of proteins that are needed to keep the skin's barrier properties intact. Nemolizumab is a humanized monoclonal antibody developed to block the production of these interleukins and prevent the loss of the protective proteins. The study's design and analysis was paid for nemolizumab's maker, Chugai Pharmaceuticals. A note in the article says the academic authors, which include Hanifin, vouch for the "completeness and accuracy" of the data. Another drug, Dupilumab, works in a similar fashion and is undergoing a final review at the Food and Drug Administration. A decision whether to approve could come within weeks or months.